Successor to the Pig Grinder mod! This is almost an exact copy of it, with minor improvements. Stuff like damaging the entity and blood FX may be added later. To get a stable and sustainable amount of resources from animals in Minecraft, players have to build a huge cage for their pets. This work requires the players to spend a lot of work, construction areas and resources. That is why the new players often meet difficulties in mining the resources. To solve this problem, Attachable Grinder Mod is created. You can now discover the resources from several kinds of creatures in nature just by the attachable grinder the mod adds to Minecraft. Normally, to get the resources, sometimes you have to kill animals, and you need to have some tools to enchant with the Loot, which was difficult to enchant when surviving in Minecaft Vanilla. The Attachable Grinder Mod allows you to get the resources from creatures without actually killing them. It works on 6 mods: pigs, cows, chickens, zombies, creepers, and skeletons. 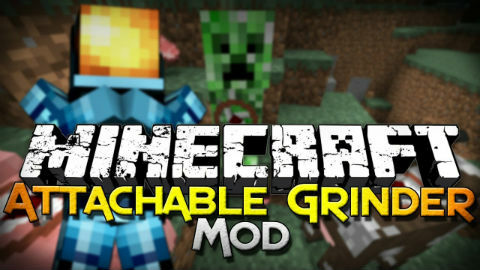 Your work is attaching grinder on any random animal, then it will begin to spit out items the mod would drop on death. The pig will drop Raw Porkchop, a cow will drop Raw Beef, a chicken drops a feather, a creeper drops a gun powder, a skeleton drops Bonemeal…While you are far away or offline, the grinder itself will not work. Therefore, you are not worried about your grinder target despawning when you move too far away or log off your world. The grinder will prevent the target from fading out of existence until you return. To sum up, if you hate building spawners, the Attachable Mod is absolutely for you.